You know those days when the fridge is filled with tids and bits and if feels like there’s nothing to eat? Yeah, you know those days, usually Fridays for us. We fill the fridge on weekends, but not too much as I hate when produce goes bad before you’ve had a chance to use it. It’s such a waste. When I have time during the week I replenish as necessary, but some weeks are particularly crazy and Friday rolls around and the fridge starts looking like an abandoned ship. A couple of Fridays ago parts of Italy were hit with a rather important snow fall and Milan was on high alert for heavy snow. My students decided to take the day off work and avoid driving into the city so my lessons got canceled and I was home for a snow day. Never mind that Milan didn’t end up getting much snow at all and it turned out to be a bit of a joke of a snow day for a Canadian like me, but I didn’t mind the impromptu day off, and I wasn’t going to complain about the lack of snow either. Growing up in Ottawa I got my fill of snow to last me a lifetime. Lunch rolled around and this roasted winter vegetable concoction was born out of the bits of vegetables left in my refrigerator. 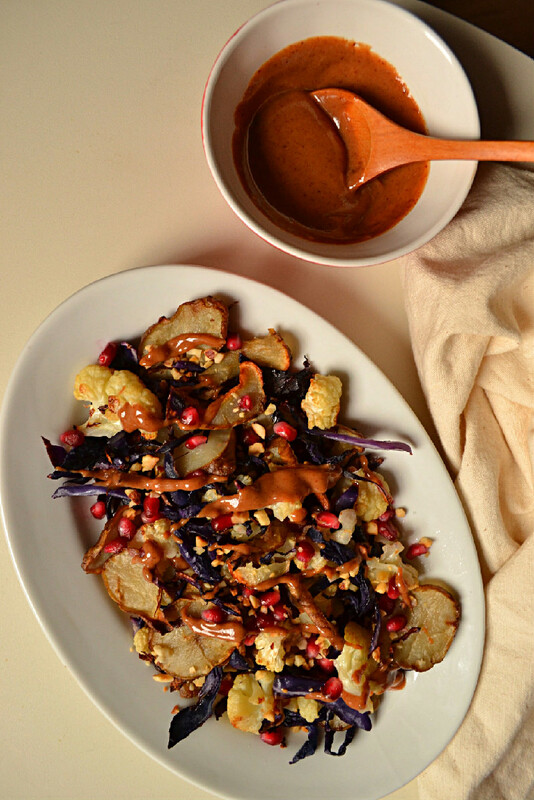 Cauliflower, jerusalem artichokes (aka sunchokes or topinambur), and red cabbage, roasted in the oven, topped with pomegranate seeds and drizzled with this delicious savoury almond butter and umeboshi vinegar dressing. It was so pretty that I decided to photograph it and share it with you. The prep time took all of 10 minutes, then about 30 minutes in the oven and lunch was ready with a side of hummus on sourdough toast. Delicious, nutritious, and a great way to use up what was left in the refrigerator. It’s so simple, that it feels wrong to call it a recipe. So let’s just call it an idea. Feel free to change up the vegetables and/or proportions, or to double, triple or quadruple the quantities to feed a family. It’s really as simple as that. Just make sure you don’t crowd the vegetables too much on the roasting tray or they’ll steam and won’t brown. To make a #fancyladylunch out these roasted vegetables I whipped up an almond butter umeboshi vinegar dressing with 3 ingredients plus water. It’s my go to dressing for vegan nori rolls and it was just as fabulous paired with these roasted jewels. Almond butter is an essential part of my diet. I put it in my porridge, I spread it on sourdough toast or sprouted bread, I bake with it, put it in pancake or crêpe batter or smoothies, I bake with it, and even make savoury dressings out of it. Raw almond butter, made of pureed raw almonds, is an excellent source of plant protein and is high in linoleic accid, the body’s essential fatty acid. It is also a great source of vitamin E, some B vitamins, and Calcium, among other vitamins, minerals and nutrients. Here, almond butter is paired with soy sauce and umeboshi vinegar adding a savoury, slightly salty and sour taste. Umeboshi plum vinegar is not actually a vinegar, but the brine of fermented umeboshi plums or japanese apricots which have been pickled in salt, sometimes with shiso leaves, and then aged for several years. The resulting liquid or brine is then separated and sold as umeboshi plum vinegar. The plums/apricots and their brine have healing properties and are used medicinally to aid digestion and reduce excess acidity or alkalinity in the body and in cooking to add umami to vegetables, grains, salads, dressings, dips and spreads. Place vegetables in a single layer on the baking sheet, separating the vegetables that have shorter cooking times. In this case, I separated the red cabbage, as it tends to roast rather quickly, and I removed it from the oven before the rest of the vegetables. I also sliced the sunchokes quite thin so they would cook at the same time as the cauliflower. If your sunchokes are too thick they will need a good 40 minutes, while cauliflower takes about 25-30. 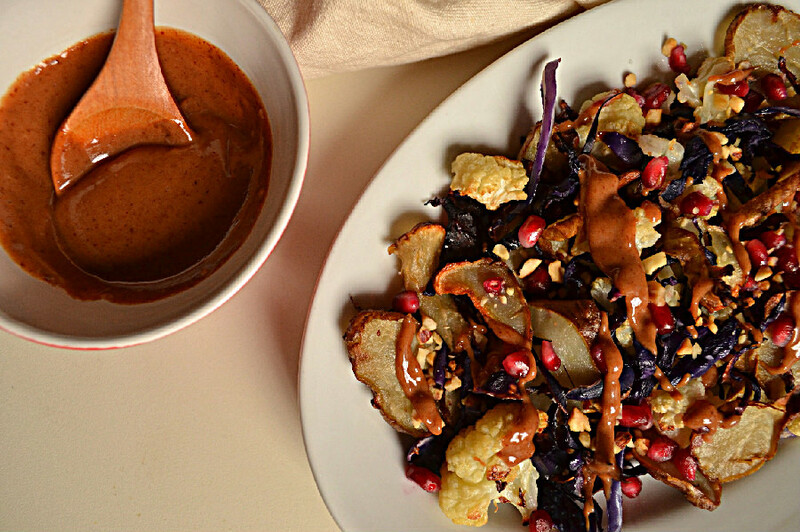 In the meantime, prepare the savoury almond butter dressing (recipe below) and set aside. Once vegetables are roasted to perfection, or just a few minutes before, add in any vegetables you removed earlier, toss them all together and return to the oven to heat everything through for about 5 minutes. Remove from the oven, transfer to a serving dish and drizzle with savoury almond dressing. Mix almond butter and 1 tablespoon of water until smooth and thick. Add tamari, umeboshi vinegar and mix well to combine. Add more water as needed, a few drops at a time, until you have a fluid consistency that runs off the spoon and is easy to drizzle (but not runny and liquidy). Drizzle over roasted vegetables or use as a dipping sauce for nori rolls (aka vegan sushi) or rice paper rolls.